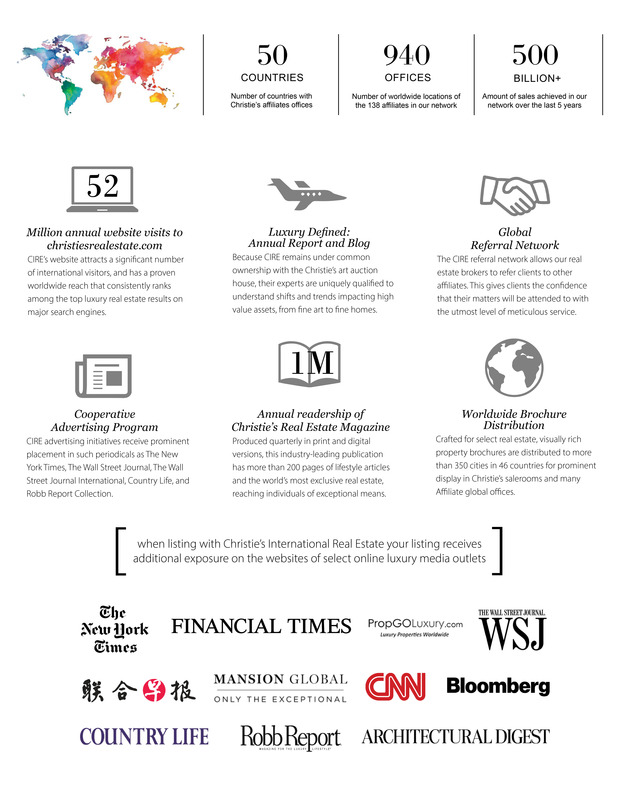 TREC holds its affiliation with Christie’s International Real Estate (CIRE) in the highest regard and continuously utilizes the many resources and avenues an affiliation of this caliber affords. In doing so, TREC is able to make every client/broker experience that much better and that much more effective. After all, both TREC and CIRE believe that elegant homes deserve elegant showcases. Christie’s is the only real estate network wholly owned by a market-leading fine art auction house. It was founded in 1995 and boasts the largest network of real estate brokers dedicated to marketing and selling important properties. The network is uniquely positioned to follow the footprint of its parent company, Christie’s, into the growing markets of the Middle East, Russia, and China, as well as established economies across the world, most notably North and South America and Europe. The values that distinguish Christie’s—commitment, expertise, integrity, discretion, and five-star customer service—are likewise embedded in the company’s luxury residential property specialists. CIRE takes pride in maintaining its high-end level of service in the luxury real estate market and the company has strict rules, which all who are affiliated must adhere to. Only brokers who have a leading market share, meet strict standards of service excellence, and demonstrate proven records of success in handling distinctive properties can become affiliated brokers and utilize the well-known and highly respected Christie’s International Real Estate brand. THE CHRISTIE'S DIFFERENCE The fabric of the Christie’s art auction house and its real estate network is woven quite differently than its competitor, Sotheby’s. The very foundation of ownership in the two entities is corporately and stylistically disparate. Christie’s is solely owned by one individual -- Francois Pinault -- who resides in Paris, is a multi-billionaire and whose portfolio also includes Gucci, Balenciaga and Stella McCartney, among others. He is known as possessing one of the finest art collections in the world, not to mention is a collector of some of the finest properties in Europe. Christie’s International Real Estate is fully supported by the auction house through joint marketing efforts with its chosen affiliates (not franchisees), allowing access to high net worth art collectors and property owners worldwide. The Sotheby’s trademark was acquired from the Sotheby’s Auction House and absorbed into a network of real estate, travel, hospitality and car rental companies by corporate conglomerate, Cendant. It was subsequently “spun off” by Cendant resulting in the formation of the publicly traded company, Realogy. Apollo Management then acquired Realogy in 2007 and its franchised network now includes Better Homes and Gardens Real Estate, Century 21, Coldwell Banker, ERA, and Sotheby’s. The major differences between these “brands” is that of privately versus corporately driven businesses, “affiliated” versus “franchised” networks, and the fact that CIRE is fully owned and operated by the world’s finest art auction house, with shared clientele and marketing venues. TELLURIDE ARTS was established in 1971 as the Telluride Council of the Arts and Humanities, known for over 40 years as TCAH. The organization was the first non-profit in the region, and served to incubate a culture of the arts that has come to define Telluride. Over the years its mission has remained virtually unchanged -- advance Telluride as a center for extraordinary artists, who infuse our authentic mountain community with world-class ideas. Recently, Telluride Arts has established the Telluride Arts District and became one of the first Certified Creative Districts in the state, developed branding and marketing for the Arts District, strengthened partnerships with the Town, County, national and local partners, led planning for Wayfinding and Space for the Arts, and positioned the organization as a leader in our community. Its programs elevate and promote a culture of the arts in the Telluride Arts District, which is comprised of numerous institutions, Events, and artists from around the region and across the globe. Telluride Arts District is continuing its vision with the restoration of the Telluride Transfer Warehouse (above), built in 1906, to become a center for the arts at the heart of Telluride. The Telluride Transfer Warehouse is a National Historic Landmark that has been roofless and deteriorating since 1978. It was a bustling hub where people and goods flowed from the trains, through the building, and out into the towns and the mines. The iconic, historic exterior will encase a light-filled, contemporary space that will be a magnet for extraordinary art, culture, and ideas from across the globe. The Warehouse provides a one-of-a-kind opportunity for people to connect with Telluride’s rich history at the heart of our community. As an affiliate of Christie’s, TREC’s partnership with the Telluride Arts District only seemed natural. As an affiliate of CIRE, a partnership between TREC and Telluride Arts District only seemed natural. TREC is excited to tap into its art connection stemming from Christie’s and proud to be a sponsor of Telluride Arts District. “TREC is a valued partner of Telluride Arts, and advances our mission by promoting the Arts District, exhibiting the work of local artists, and supporting the overarching mission of our organization with direct sponsorship and enthusiastic support from both staff and agents" said Kate Jones, Telluride Arts Executive Director. To view the work of talented local artists, visit our office lobbies, where pieces are on rotating display.